Jenna Kara, 29, and Tina Kara, 34, directors of Landrose Developments Ltd, started tearing down the bungalow in Stanmore, north-west London, in 2016. The company pleaded guilty at Willesden Magistrates' Court to damaging or destroying the breeding site. District Judge Denis Brennan said the punishment for ignoring environmental law would "always outweigh" gain. 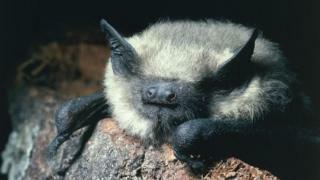 The court heard the developers had pressed ahead with the demolition despite an expert reporting the site was home to soprano pipistrelle bats - a protected species in the UK and Europe. Passing sentence, District Judge Brennan said: "In my judgment, the act of demolition was clearly deliberate and flew in the face of advice and knowledge of the existence of the bat roost. "The most obvious effect is local but it also has national implications because these bats are an endangered species by the very fact of being protected." The court heard that in a 2017 statement ecologist Jan Collins said the vast majority of offences against bats related to demolition and renovation of buildings. Landrose Developments Ltd pleaded guilty to damaging or destroying a breeding site or resting place of a wild animal of a European protected species between September 2016 and June 2017. Video Would you give bats a home in your fridge?